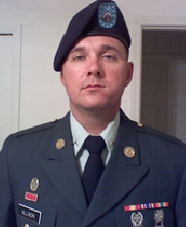 Army Sergeant Alan Allison joined the military out of Charlotte, North Carolina in 2007 because he wanted to serve his country, provide for his family and receive an education. He served until he was honorably discharged in 2015. Throughout his eight years of service, including multiple tours in Iraq, Sergeant Allison sustained many physical and psychological injuries. In one incident while jumping from a Humvee, he hurt his back, neck, left shoulder and left ankle. His years in combat also left him with severe PTSD. He also sustained injuries to his spine, nerve damage, memory loss and sleep apnea. For his service to his country, Sergeant Allison has been awarded the Army Commendation Medal, Army Achievement Medal (7x), Army Good Conduct Medal (2x), National Defense Service Medal, Global War on Terrorism Service Medal, Army Service Ribbon and Overseas Service Ribbon. Sergeant Allison, his wife Michelle and their four children were gifted a mortgage-free home in Beckley, West Virginia in April 2017.